Every student who goes to college eventually has the same thought: Textbooks aren't cheap! Somedays, it feels like a ripoff. You pay hundreds of dollars for new textbooks with the promise of selling them back used at the end of the semester, only to find your edition is being discontinued or receiving pennies on the dollar for your books. Fortunately, the rise of online sellers often offers a better alternative to your one-stop university bookstore. 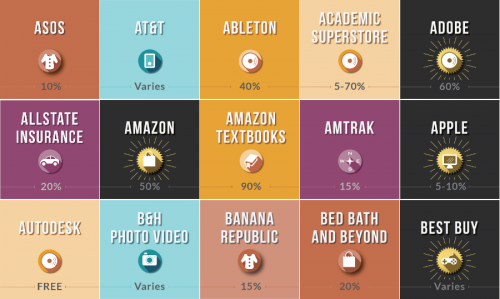 Amazon, Chegg, and eCampus offer some of the best options for buying, renting, and selling your college textbooks. By buying used, you can often save up to 90% off the new price of many college textbooks. Amazon succeeds especially well at this, so start your search there. Be sure to check the edition number, as publishers like to update popular books frequently. Sometimes the editions don't change much so you can get away with an older edition. Why buy, when you can rent? When you rent textbooks, you pay a fee for "borrowing" the book for the duration of the semester. When you are finished, you ship it back. Renting is certainly cheaper than buying. While you don't get any money at the end of the transaction, your price is locked in up front. Many publishers now offer textbooks online for digital reading. This is ideal especially for textbooks you don't use that often, and for saving you back carrying all those books around. Again, Amazon likely has the best selection of digital books, but be sure to shop around. Selling your books online is often superior to selling at your local bookstore. This is because there's often a larger market for your book online than the one limited to your campus. You can typically sell your book to any of the online book retailers. This means you can sell it to a retailer even if you bought your book on campus or elsewhere. Best advice is to buy your books as soon as you get your syllabus. Popular books often run out, and you'll pay more if there's a short supply. Also, remember to take care of your books so you can earn a decent buyback price at the end of the semester.